There is something mysteriously nurturing about living plants & flowers that change an atmosphere like few other elements can. And that is what a good floral designer will do...change the atmosphere to match the occasion of your event. Our artful arrangements set the tone and help to tell your story, whether it's a story of a company's flawless reputation, or a story of love that overcomes. 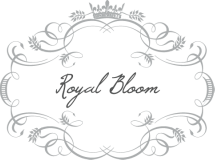 It's part of our nature, at Royal Bloom, to always take into account what makes you and your story unique, and combine your vision with our talents to deliver exceptional floral arrangements that belong in your setting. We look for ways to put the common to extraordinary use, resourcefully selecting materials and showcasing the best of creation. Bay Area Native, Indelisa, has been altering event atmospheres with flowers since 2002. She studied Visual Presentation & Space Design at the Fashion Institute of Design & Merchandising after earning her BA in Family Consumer Sciences at Seattle Pacific University. 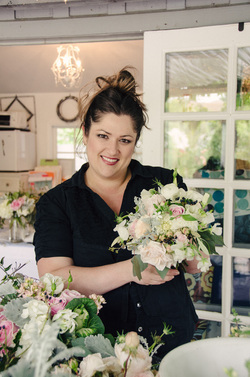 When all's quiet at the floral studio, you'll find her at the local farmer's market, picking ripe fruit for jam-making, exotic veggies for culinary fun, or enjoying the sunshine with family & friends and a latte in hand!